Real estate has always been one of America’s most lively industries. Every year, some two million licensed agents and 86,000 brokerage firms work day and night to move billions of dollars worth of commercial and residential properties. Bearing that in mind, it’s not difficult to imagine why so many young professionals flock to join the industry. But it takes a lot of hard work and meticulous organization in order to achieve success in real estate. That’s something Tyler Smith, founder and CEO of industry game-changer SkySlope, found out the hard way. In hindsight, that was some pretty awful advice. Immediately after closing on the deal, Smith’s new hot water heater broke down and ended up costing more in repairs than it would have taken to purchase a home inspection and a home warranty. The awful experience convinced Smith that if his Realtor could offer that sort of customer service and still make “a huge chunk of change”, anyone could make it in the real estate industry. That being said, the industry was a bit harder to crack than Smith has initially hoped. The business Smith refers to is SkySlope — a rapidly growing B2B software as a service (SaaS) platform that helps real estate agents and brokerages effectively manage their transactions online. Since its inception in 2010, SkySlope has grown by leaps and bounds. The company’s business has more than doubled in size over the last 12 months, and now helps to manage the transactions for some of America’s largest brokerages. Century 21, Keller Williams and Alain Pinel have all fallen head-over-heels for SkySlope’s ever-expanding pool of offerings. That being said, SkySlope wasn’t built in a day — and it took Smith quite a while in order to assemble the perfect team to address the industry concerns that had plagued his own time selling real estate. SkySlope’s team of cutting-edge developers were able to achieve those goals in record time. But from there, Smith said he was surprised to find just how challenging it would be to ensure that his new, game-changing software actually took off. “I laugh now because I had no idea the amount of work and people power it would take to produce, sell, onboard and support a product like SkySlope,” Smith says. But once Smith and his small team were able to build a bit of momentum, the ball started rolling fast. Fast-forward a couple of years, and SkySlope is now home to 70 employees. Based in sunny Sacramento, the company has already established poll position as the real estate industry’s leading SaaS provider – and it’s not hard to see why. That service has already proven invaluable to small, independent brokerages in helping them to establish unbeatable levels of customer service. In turn, small business owners are drastically improving their competitiveness over the real estate industry’s global giants. At the end of the day, it’s this notion of providing great value that drives Smith and his ambitions for SkySlope. 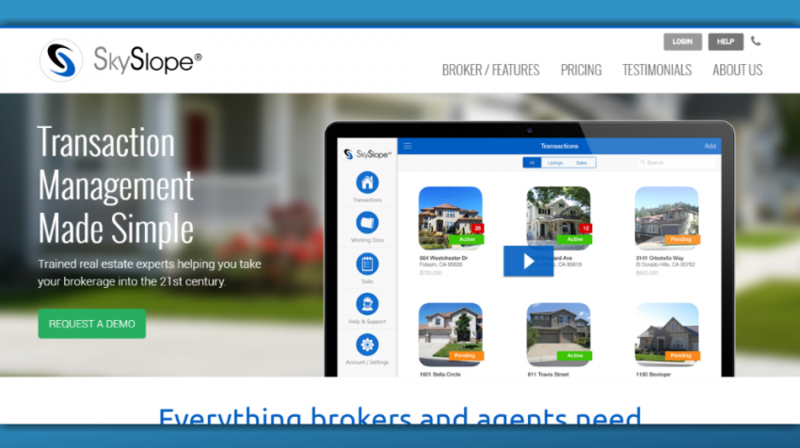 After all, the real estate industry is ever-changing – and the SkySlope CEO is well aware that his company’s services must continue to evolve, too. According to Smith, full automation is undeniably where the industry is heading. And by simplifying procedures for bustling brokerages, real estate experts will be able to free up their time in order to offer more support to hard-working agents on the ground.